With charcoal infused bristles, Colgate Slim Soft (Charcoal Black) Toothbrush effectively removes plaque bacteria. With slimmer bristles and flexible neck, it gently cares for the teeth. It reaches deep in between teeth and along the gum line, leaving one with a fresh breath all day long. With charcoal infused bristles, Colgate Slim Soft (Charcoal Black) Toothbrush effectively removes plaque bacteria. 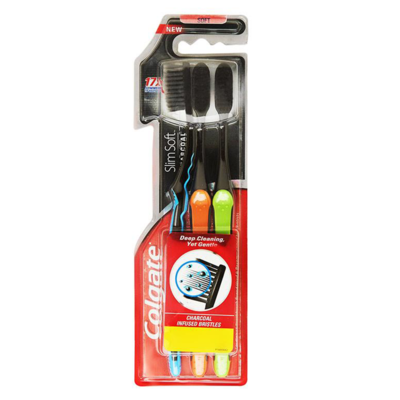 With slimmer bristles and flexible neck, it gently cares for the teeth. It reaches deep in between teeth and along the gum line, leaving one with a fresh breath all day long.